"Thanks to our cohesion, we have been able to react to Modolo's problems, finding ways to be actors and playing all the our cards well. Their efforts were rewarded with a good 7th place for Cimolai." Sacha Modolo's run of bad fortune continued in yesterday's Vattenfall Cyclassics as the Italian sprinter abandoned the race due to back pain. Instead, Davide Cimolai took over sprinting duties and scored important WorldTour points for Lampre-Merida by taking 7th. Sacha Modolo started his first season with Lampre-Merida with a bang but since then nothing has gone to plan for the fast Italian. He missed the final part of his spring season due to a crash in Paris-Roubaix and he abandoned the Tour de France due to illness. Another crash took him out of the Eneco Tour and left him with uncertainties for the Vattenfall Cyclassics which was one of his big goals in the second half of the year. Again he was hit by bad luck as he had to withdraw from the race with back pain. Instead, Lampre rode in support of Davide Cimolai who finished off a strong showing that also included attacks from Niccolo Bonifazion and an in-form Manuele Mori, by taking 7th in the bunch sprint. "Thanks to our cohesion, we have been able to react to Modolo's problems, finding ways to be actors and playing all the our cards well," sports director Simone Pedrazzini said. 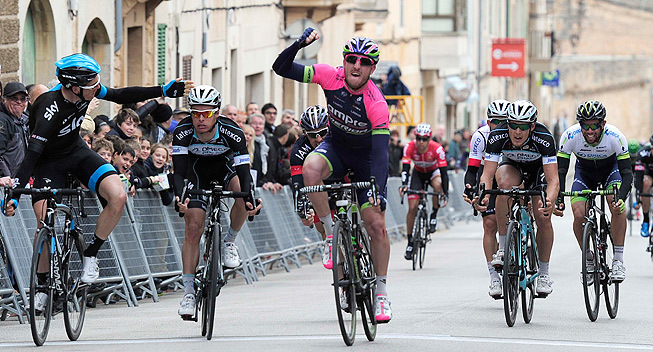 "Their efforts were rewarded with a good 7th place for Cimolai. "In a World Tour race a place in the top 10 is always valuable, considering the WorldTour points that follow. If you add the fact that Davide crossed the finish line just behind pure sprinters like Farrar, Kittel and Cavendish, the result has even greater value.